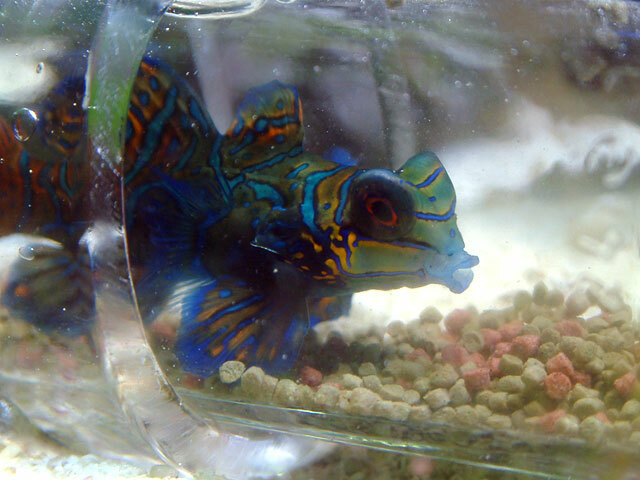 For a long time my blue mandarin was a very happy fish in my 29g, and would eat prepared foods much to my delight. Since that was the case, I never worried about it. However, in the 280g reef, it was actually being starved to death due to stress by the other mandarins harassing it as well as the voracious Tangs that would circle around it and get every morsel of food off the sand. This mandarin used to eat pellet food in my 29g, hence I decided to make a mandarin feeder today. My tangs are voracious diners, and loved to eat the pellet foods resulting in my mandarin not getting her share any longer. 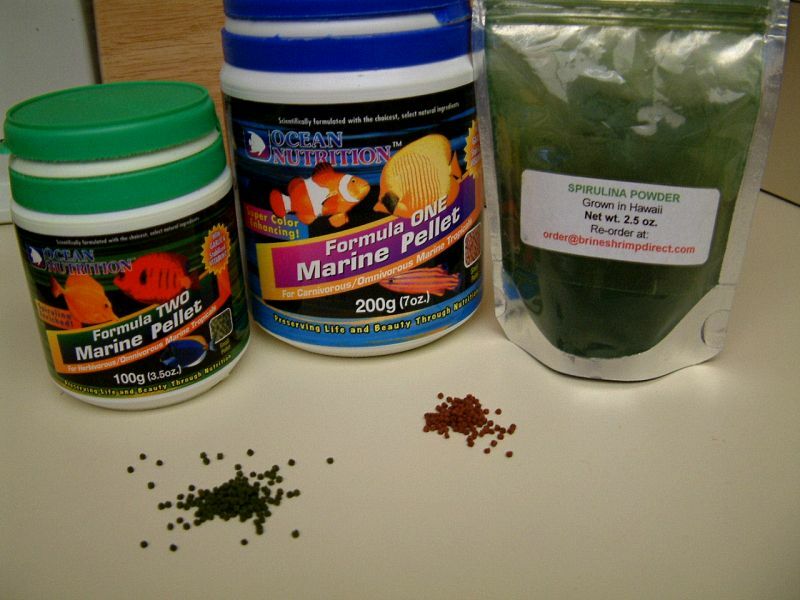 I used a long empty glass bottle, added the pellets first and then tank water, and gave it a few seconds for the pellets to sink into the bottom of the jar. Then I lowered it into the corner the mandarin tends to visit. As you can see, the tangs were quite interested in the pellets, pecking at the glass quite a bit. 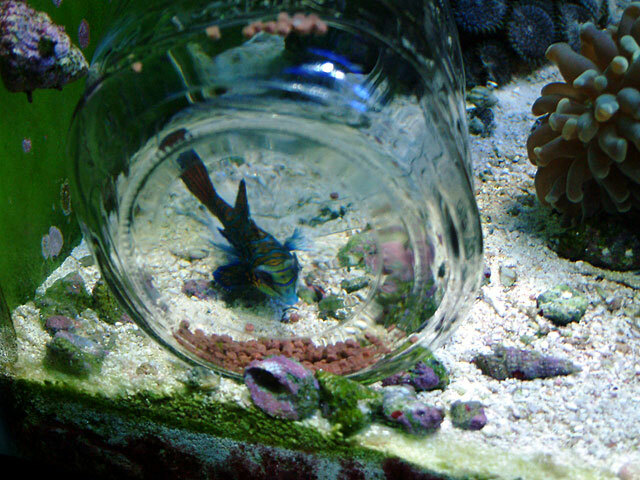 Next thing I knew, the wrong guy got in there, and was caught red-finned. A few minutes later, the right patron found the food supply, and dined at the all-you-can-eat buffet for about 5 or 10 minutes. Soon a gentleman caller came by to join her, but never made it past the maître d'. :) About 30 minutes later, the buffet was gone as if it never existed. All that remained were the busboys, a pair of nassarius. The problem was that the other fish liked that food too, and the smaller tangs would fold up their fins and slip in to get the food and back right out again. 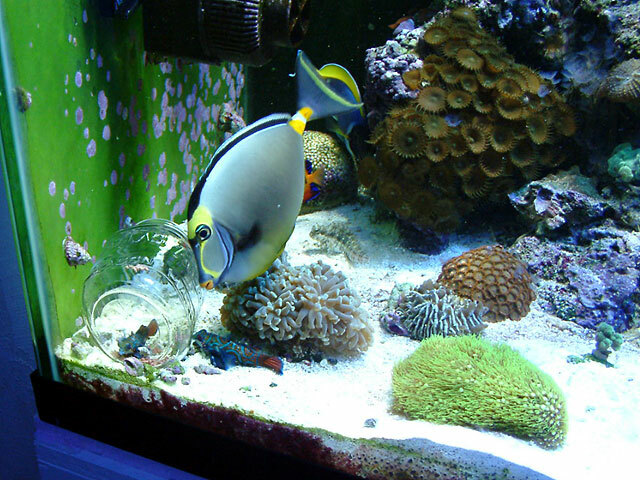 I watched my huge Naso Tang hover in front of the mouth of the jar, and wave its fins back and forth to create current which would wash the pellets out into the open where it could eat them. He was very adept at this, as I saw him do it often. So after a month of this, I finally bought an olive jar, as that would limit the size of the fish entering the Diner. 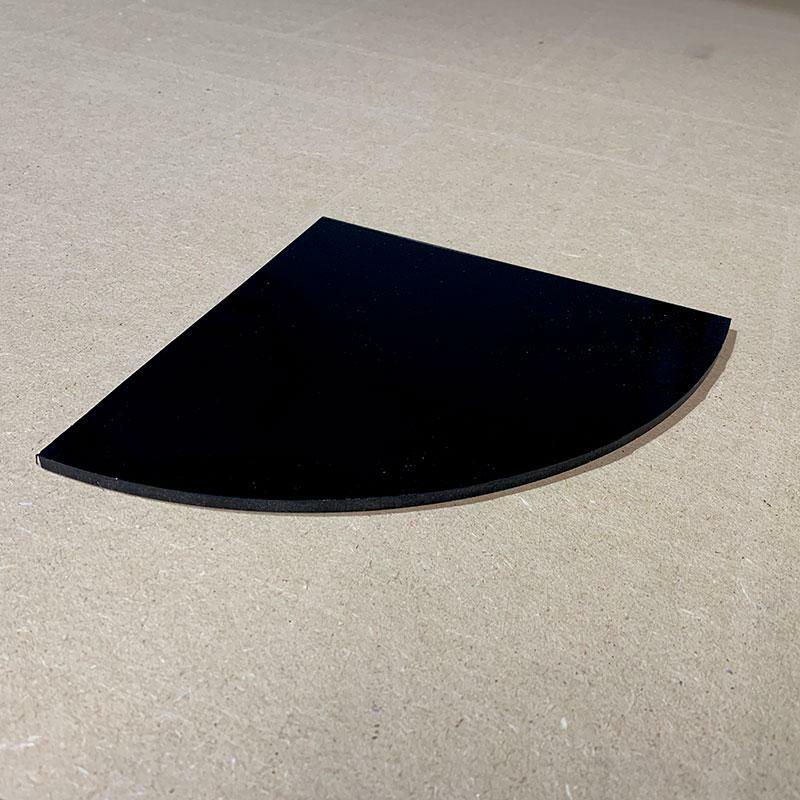 I took a piece of acrylic, heated it and wrapped it around the jar to act as handle for easy reach on a daily basis. 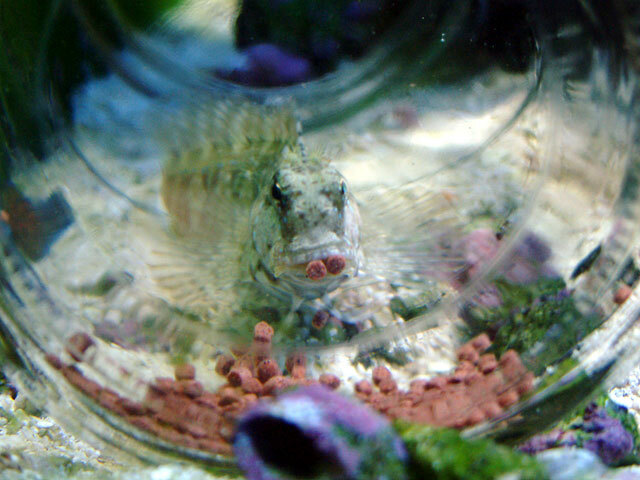 I even tried feeding her some newly hatched baby brine shrimp, but that really didn't work out so well. I never bothered trying it a second time. I've continued to use a mixture of the two pellets every day, and the mandarin is almost back to its original plump self. Keep in mind that I feed newly hatched brine to the tank every day, with the pumps off. This allowed the smaller fish the opportunity to eat, and the larger fish just wade through the food like whales. 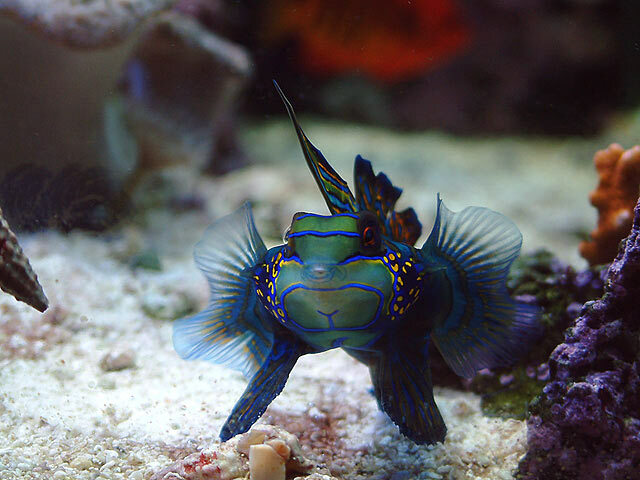 Other fish still go in the Mandarin Diner, including my Six Line Wrasse, the Lawnmower Blenny, Blue Damsels... but the tangs can only hover near the opening hoping for stray pellets to accidentally flush out. Various snails and hermits go into the Diner at night, and each morning I refill it for the new day with about 1 tsp of pellets. If there is too much food in the jar, it tends to rot and ferment, and an airbubble collects in the jar. That is a good indicator of overfeeding. Dump that in the sink and rinse the jar out with tap water, and use less food in the future. 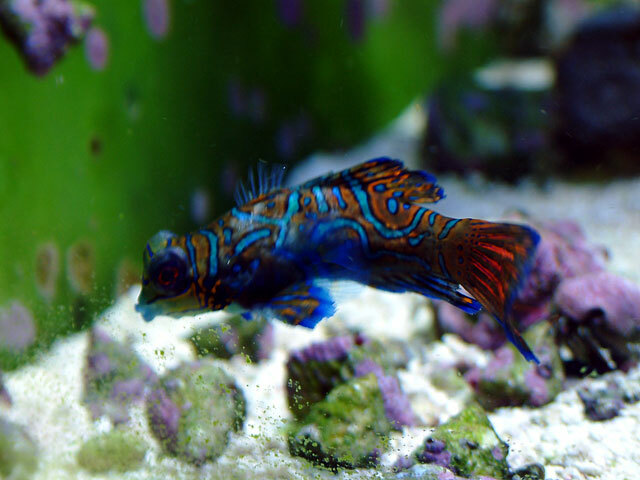 I have four Mandarins in my tank, but the Blue ones are the ones that are near it constantly. They travel the tank, but know the food is at the Mandarin Diner daily. There are times I've lifted the diner with fish in it, dropped in more food and let it back down. Other times I'll put the food down on the substrate, and within 10 seconds the mandarin goes right in. 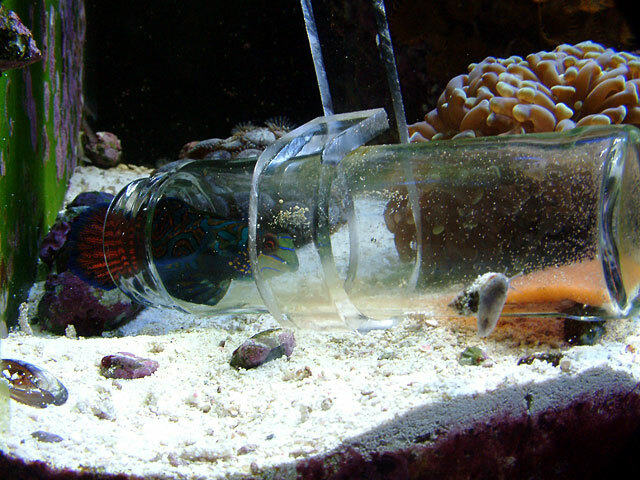 It is important that the opening of the jar is at the substrate's surface so they can swim right in. I'm really glad this has worked out so well, as do they. I just combined 2 tanks into 1 larger system and am experiencing my mandarin getting skinnier also. I am trying your diner idea. BUT if /when this works I want to add more mandarins to my 180. 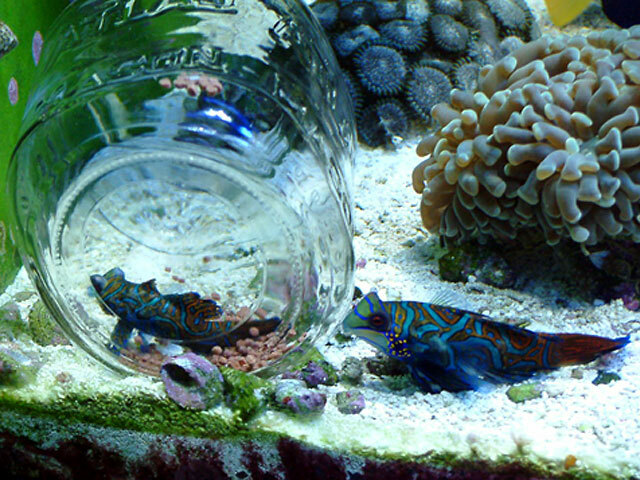 Can target and psychodelic male mandarins live together? I see you said you had 4 mandarins living in a tank? Can two males of the different mandarin species live in a 180 gallon? My goal is a matted pair of mandarins and if I am doing all this anyway to feed my mandarin seems logical to have 2 pairs. thanks! !